For a person trying to avoid getting type 2 diabetes or a diabetic, nutrition labels can be useful in making sure the food that is chosen is certain to be healthy. To help you have balanced diabetic meals which are home-cooked or to know what prepared snacks or meals to buy, you can get some assistance from the nutrition labels attached to the packaging of the food. When picking up the food in its container, read the facts given in the nutrition label and know the serving size as well as the number of serving in each container. You should also look at labels of similar products and in order to know which to pick, the one with the least amount of calories ought to be the choice. Let us see what ought tobe expected in the labels, understand them easily and always have the habit of referring to the labels as a part of shopping. The quantity of food to be used in a serving is the serving size. 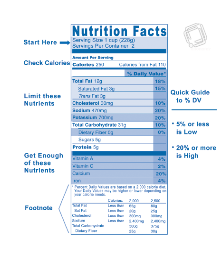 It is necessary to know that whatever information given in a food label is for only one serving. However, you have to realize that the portion eaten by someone may not necessarily be the equivalent of the label’s serving size. To have it equivalent, you may have to either add or subtract some food. 3 ounces of poultry or meat are equivalent to a deck of cards. 3 ounces of fish are equivalent to a checkbook. 1 ounce of cheese is equivalent to 2 slices or 4 stacked dices. Half a cup of vegetables or pasta is equivalent to half a baseball. A quarter cup of dried fruit is equivalent to one golf ball. 2 tablespoons of dip, oil or mayonnaise are equivalent to a ping-pong ball. 1 teaspoon of margarine or butter is equivalent to your thumb’s tip. Many packages of food have more than a serving in each package. Go to the food label and you will be told how many servings are in the container under the heading “Servings per Container”. Calories tell you the amount of energy that the body can get from a food. From the food label, you know the total calories of the food in the container as well as the number of calories from fat in a serving. Cholesterol - When a food contains cholesterol which is less than 21 milligrams, it is considered a low-cholesterol food. Not more than 300 milligrams of cholesterol should be eaten in a day. For people having high cholesterol or diabetes, they should not consume more than 200 milligrams. A hamburger weighing four ounces contains cholesterol of approximately 70 milligram. Total Fat - Approximately 5 grams is a fat serving. An estimated 50 to 65 grams of fat per person each day is needed by many people. A teaspoon of oil or butter has approximately 5 grams of fat. Consumed saturated fat should be lower than 7 percent of each day’s total calories. Never use Trans fat as research has indicated that Trans fat can increase bad LDL cholesterol that is linked to the development of heart disease. Foods which are deep fried, commercially baked, or cooked with vegetable shortenings and margarine contain Trans fat . Sodium – The foods in each serving should contain sodium which is not more than 400 milligrams. Intake of sodium for most people ought to be not more than 2,400 mg per day. The amount of sodium in a teaspoon of salt is 2300mg. Fiber – There should be at least 3 grams of fiber in each serving. Between 25 and 35 grams are needed each day by many people. Protein – The amount of protein needed each day by most people is approximately from 50 to 80 grams. You should eat at least two servings of fish every week. It is not advisable to fry the fish. There are approximately 7 grams of protein in each ounce of meat. Carbohydrates – Carbohydrates includes sugar alcohols, sugar and dietary fiber. There are approximately 15 grams of carbohydrates in a serving. The amount of carbohydrates needed each day by many people is approximately 300 grams. Carbohydrates can be obtained from low-fat milk, legumes, whole grains, vegetables and fruits. You get approximately 15 grams of carbohydrates from an ounce or a slice of bread purchased from a store. Ingredients– These are the things used in the manufacturing of the food. Ingredients are shown on food labels in a descending order with the biggest amount used at the top and the least amount at the bottom of the list. So, if flour is right at the top of the list, it means that the manufacturer used more flour than any other ingredient. And if nuts is the next ingredient, it means that it is the second largest amount used by the manufacturer. The ingredient at the bottom of the list is the one with the least amount used in the manufacture of the food. Health claims given on labels can confuse consumers. Words such as “fat-free” and “reduced fat” do not give an exact picture of the food. However, such claims have to follow the criteria given by the government. Such claims should be used together with other information given in the label to help you to make your choice. Truth is, health claims are not necessary for you if you use the guidelines given above. Health claims are mainly words used to market the product, it is short and attractive, just like some kind of slogan. If you read the label facts, you do not need to depend upon such health claims as “healthy food for diabetics” to make your healthy choices.So, be an expert at label reading to be able to make the right decisions. There are usually no labels on fresh vegetables and fruits. Once in a while, pre-packaged vegetables and fruits do come with labels. Fortunately, fresh vegetables and fruits are usually alright to eat. The difficulty is in knowing what the right diabetes food is. It must be remembered that there is sugar in fruits and eating a lot of them can raise the blood glucose level. So, it is necessary to know the sugar content of such fruits. So, for all products bought at a store or supermarket, look carefully at the label and know its information from top to bottom. How much of the food is a serving? What is the number of servings in the package? A dietitian who is registered and a diabetes educator who is certified can assist you to learn the use of labels for your diabetes diet plan. Remember the importance of nutrition.